To those who have been used to seeing a China that has been keeping Tibet under an iron wrap, the opening of Tibet as an international tourist destination has come as a surprise. As if this was not enough, Beijing has undertaken yet another step that was quite unimaginable until only a few years ago. From early August this year Beijing has started taking selected foreign journalists on conducted tours of the same very 'Roof of the World' that it has been hiding from media for over 50 years now. However, the most dramatic of all these steps was the renewed contact between Beijing and Dalai Lama which remained snapped since 1993. The renewal of this contact was marked by the visit of the exiled Tibetan ruler's elder brother Gyalo Thondup to Beijing and Lhasa in early August and that of a four-member Dharamsala delegation to Beijing and some parts of Tibet within a month of Gyalo Thondup's visit. As far as the opening of Tibet as an international tourist destination is concerned, the effort has more than one aims. One is the showcasing of what Beijing claims 'the economic progress and religious freedom' being enjoyed by the Tibetan masses under its 51 year rule. And the other is to rake in a few billion dollars from teaming tourists from abroad. A brilliant example of making political and financial capital out of an issue that has, so far, been a mill stone around Beijing's neck since it sent in its People's Liberation Army (PLA) in 1949 to occupy Tibet. One section of these tourists comprises of the faithful and rich Buddhists from Taiwan, Hongkong, Mainland China, Singapore, Korea and Japan etc. who leave behind heaps of Yuans in front of statues of Shakyamuni Buddha and Avalokiteshwar in Tibetan temples and monasteries. The other section, interestingly belongs to the same very westerners who know Tibet mainly because of Dalai Lama's fight for human rights and self rule for his countrymen. The third reason, as presented by Prof. Samdong Rimpoche, Prime Minister in Dalai Lama's government-in-exile, is Beijing's eagerness to present a Tibet friendly face in its run up towards Beijing Olympics-2008. Going by what one sees inside China's Tibet or what one has heard following Dalai Lama's delegation's visit to Tibet, Beijing leaders appear to be succeeding in their latest Tibetan game. DECEPTIVE VISUALS The very first visuals that China's Tibet presents to an outsider in a city like Lhasa or Shigatse are quite overwhelming. 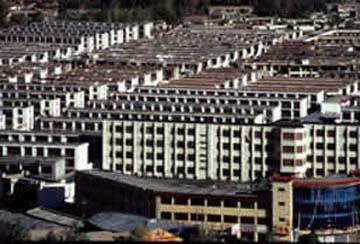 Wide, open, geometrically running roads flanked by some of the most fashionable shopping complexes and multistoried buildings offer an unexpected shock to those who expect Lhasa still to be a poor town of rain washed mud houses. The very next shock comes from the crowds of Tibetans circumambulating Potala Palace, Jokhang temple and Tashi Lhumpo monastery to those western tourists who believed that China 's role in Tibet during past 50 years was limited only to destroying monasteries, temples, Chortens (Stupas) and arresting anyone who dare holds a 'Mani' (prayer wheel). Many among these crowds are villagers from distant places who travel to Lhasa for pilgrimage in the best of their traditional costumes. Holding their rosary and traditional prayer wheel in their hands these pilgrims offer a perfect picture post-card image that Tibet has been popular for among the western world. However, this is the last meeting point of those tourists who are overwhelmed by what they see in China's Tibet and those who are keen to go beyond what is easily visible. One needs to take only a 10-Yuan ride in a taxi in any direction away from Potala to discover who are the real beneficiaries of this progress -- local Tibetans or the Chinese who arrive by thousands every month to settle in Lhasa is search of new jobs that are being created regularly by the Chinese masters of Tibet? Just a peep into the multistoried houses, government offices and glittery shopping arcades will tell you that a large majority of houses, jobs and businesses belong to the Chinese. Tibetans get the crumbs viz. low menial jobs like street sweepers, drivers and, of course, junior and meaningless positions in the local civic bodies. TOURIST GUDES Interestingly, the job of a tourist guide is one that the local Tibetan boys and girls get easily just because western tourist hate to have Chinese guides who talk more political propaganda than anything else while taking the tourists around Potala palace of Dalai Lama or the Tashi Lhumpo monastery of Panchen Lama in Shigatse. However, the most common complaints about Tibetan guides' poor English language because the licenses of almost all good English speaking Tibetan guides have been cancelled as most of them were educated in India in schools run by Dalai Lama's Tibetan government-in-exile. One can not fail to notice a remarkable change in the Chinese strategy on religion that used to be expressed only through brutal denial of religious freedom in past decades. Today Tibetans in tourist cities like Lhasa and Shigatse have freedom to go to temples and prostrate in open places like the Barkhor square in front of the Jokhang temple. Daily debate sessions of monks in Drepung monastery in Lhasa are well tuned with the arrival and departure of tourist buses. They present a perfect photo opportunity to all those foreign tourists who come with the hope of seeing a traditional Tibet. But once the photo session is over, no tourist is interested in finding if all the young men dressed in maroons were genuine scholars. Tourists witness a similar theatric ritual in the government run majestic Tibetan handicraft store opposite main entry gate of Potala. After your tourist guide has almost forcibly pushed you inside the store, Chinese girls dressed in unusual golden Tibetan gowns take you through well presented sections of Thanka paintings, metal crafts and carpet weaving. In her enthusiasm to tell you that the design shop of the carpet section is a serious business, the pretty Chinese designer girl starts giving fine touches to a carpet design on her easel with a fine brush. The real fun is yours provided you could notice that brush had no colour in it. But still no one can not deny that almost all visual aspects of Tibetan Buddhism are being preserved and presented to the visitors in their most glittering colours. It is a different matter that no Tibetan has the freedom to open mouth on issues unpalatable to the Chinese masters. Five monks of Drepung monastery were arrested early August this year for listening to pro-independence songs on tape. It is quite interesting to notice that Chinese soldiers are conspicuous by their absence in important places like Jokhang temple and the Barkhor street along its circumambulation. Pot bellied Tibetan policemen dominate prominent public places including the Barkhor street. But the real vigil on every movement of Tibetans and tourists is kept by the video cameras installed inside almost each room of Potala, monasteries, house tops and on trees and lamp posts in other sensitive places. CHINESE GRIP I had a first hand feel of this Chinese grip in the Barkhor street which became famous like Tien An-Men Square of Beijing for the1987 public uprising against the Chinese rule in Tibet. Nearly twenty Chinese agents of notorious Public Security Bureau (PSB) appeared from nowhere within two minutes after a petty fight broke out between two Tibetan stall owners. Both were quickly whisked away and pushed behind a huge gate which opened dramatically in a nearby room of Jokhang temple. In less than five minutes the street had no leftover signs of the melee. Everything appeared as normal and quiet as if nothing had ever happened there. However, it will be unfair to conclude that ordinary Tibetans have fully surrendered to their Chinese colonial masters, or they don't express their mind on the prevailing political situation. Beijing authorities have strictly banned the Photos of exiled Tibetan ruler Dalai Lama and Gedhun Choeky Nyima, the incarnate Panchen Lama recognized by him. Hence no one would dare to display their pictures in today's Tibet. Particularly in Shigatse, the city famous for Panchen Lama's religious seat at Tashi Lhumpo Monastery, people don't display the pictures of the two great religious leaders who are always the subject of an unending hate campaign of local political administrators. But not a single shop, restaurant, house or private vehicle I saw during eight days of my stay in Tibet, displayed the photo of Gyaltsen Norbu, the Chinese sponsored 11th Panchen Lama. As a middle way, people buy and display big posters of the late 10th Panchen Lama who was acceptable to the Beijing regime as well as ordinary Tibetans - albeit for just opposite reasons. While Chinese masters of Tibet used to present him as an alternate to the exiled Dalai Lama, common Tibetans remember him for the bold anti China stand that he took twice during his life time. RESEMBLANCE TO LADAKH The landscape and architecture in the Tsang region of Tibet that houses famous cities like Shigatse, Gyantse and Tingri, resembles dramatically to India's Ladakh region in Jammu & Kashmir state. The only element that reminds a visitor that one is in Tibet and not in Ladakh is the total absence of Buddhist Chortens (Stupa) in the Tibetan countryside. While almost all stupas in the countryside were destroyed during fateful days of Cultural Revolution the two giant stupas guarding the front of Potala are among those handful ones that appear to be preserved by the Chinese masters. However, the strategic placing of these two religious structures is enough to explain how much respect Beijing masters hold for the religious sentiments of their Tibetan subjects. In Tibet it is considered to be sinful and inauspicious to cross a stupa from the anti-clockwise direction. But the two holy structures in Lhasa have been positioned in the middle of the majestic 'Beijing Road' in such a manner that every vehicle must cross them the wrong way. No wonder you see old Tibetans closing their eyes and raising folded hands in prayer when their bus or rickshaw crosses each stupa from the anti-clockwise direction. A tourist can not miss this unambiguous patriotic statement of local Tibetans as one watches them going around inside Tashi Lhumpo monastery, the supreme seat of Panchen Lama in Shigatse. One would rarely see a Tibetan bowing or offering scarves before the Chinese sponsored Panchen Lama's photo whereas the empty seat of Dalai Lama can be marked from a distance because of full length prostration by the Tibetan pilgrims and the abnormally large heap of scarves they leave in front of the seat. In the vast cemented square in front of Potala too, people crowd around the photographer stalls to get their photos with Potala in the backdrop. But during two hours of my visit to the place I did not see a single Tibetan getting oneself photographed with the tall white Chinese memorial which was installed early this year to commemorate 50 years of 'peaceful liberation' of Tibet. Until first week of September, Tashi (35) a mid-ranking official in the 'Paljor' (Finance) department of Dalai Lama's Central Tibetan Administration (CTA) popular name for Dalai Lama's 'government-in-exile', was an excited young man. As a part of the ongoing privatization process in the CTA setup Tashi had opted for taking over a departmental book-shop as a part of the golden handshake. He and his wife who also holds a government job in another department of the CTA, had all the plans ready to convert the shop into an attractive business establishment. But the sudden news of a Tibetan delegation's visit to Lhasa and Beijing has put cold water on the enthusiasm of this young Tibetan refugee couple. "If all this leads to an agreement between Dharamsala and Beijing then what is the fun of selling books in India?" asks an utterly confused Tashi. Tashi's dilemma represents the prevailing mood in Dharamsala, a north Indian Himalayan town and the seat of exiled Tibetan ruler Dalai Lama's 'government in-exile', the air is filled with gloom, anger and confusion. A very opposite of the excitement, determination and hope that this little hilly town has been known for since the Dalai Lama fled Tibet following the aborted uprising against the occupying Chinese PLA in 1959. The just concluded 18-day visit of Dalai Lama's representatives to Beijing and Lhasa has left the 150,000 strong Tibetan community and its supporters confused and divided. The four member Tibetan delegation was lead by Lodi Gyari, Dalai Lama's Special Envoy in Washington DC. Other members include Kalsang Gyaltsen, who is the Dalai Lama's representative in Europe and two senior officials Sonam Dagpo and Ngawang Rabgyal. The visit comes on the heal of Gyalo Thondup's visit to Beijing and Lhasa early August this year. Thondup, an elder brother of Dalai Lama and an enigmatic personality among the Tibetan refugee community has been known for his close CIA links until mid 1970s and later for his close Chinese connections. NEW CHAPTER ? The main purpose of the visit of this Tibetan delegation, seventh of its kind since early 1980s and first after the contact snapped between the two sides in 1993, was to prepare a ground for a dialogue between Tibet and China. As Mr. Lodi Gyari said in his statement on the delegation's return to Dharamsala, "We have made every effort to create the basis for opening a new chapter in our relationship. We are fully aware that this task cannot be completed during a single visit. It will also need continued persistent effort and support from many sides. ", one should expect more visits and a longer dialogue. But one wonders if this will also mean a longer period of confusion and anxiety among the refugee community? The dialogue is aimed at finding a mutually agreeable solution to the Tibetan issue on the basis of what Dalai Lama has termed as the 'middle path ' that envisages 'genuine autonomy' for Tibet within the sovereign framework of PRC. Until a couple of years ago when Dalai Lama started talking seriously of 'middle path' Tashi used to be among the enthusiastic and determined refugee crowds shouting 'Rangzen' (i.e. 'freedom') for Tibet. But today Tashi, like many other Tibetans, sincerely believes that not agreeing with the autonomy theory of his leader means nothing less than opposing the Dalai Lama personally. For a common Tibetan the idea of opposing Dalai Lama has no place even in dreams. That is why Tashi has started supporting the autonomy theory even if his heart still remains tuned to the war cry of 'Rangzen'. That should explain the uneasy atmosphere of confusion, rather bewilderment among a sizeable section of refugees. But unlike Tashi a large section of the Tibetan community, especially the youths working independent of the CTA, are neither confused nor dejected. They are angry. Kalsang Phuntsok Godrukpa, President of the Diaspora's most popular organization Tibetan Youth Congress (TYC), is one who not only opposes the concept of autonomy, but he is also openly attacking the wisdom behind the new CTA initiatives. "Going by past experience with China you can not believe in what they say or promise", says Kalsang outright dismissing the idea of a dialogue with Beijing. The TYC has over 25,000 active members among the community and has been the main political training ground for a large majority of Tibetan refugees who occupy the best of places in the CTA today. The most prominent among them are the 'Prime Minister' of the exile government, his cabinet members, heads of departments and most staff members of 'Theckchen Choeling' Dalai Lama's private office. DRAMATIC VISIT Meeting in the wake of a high profile and dramatic visit of Gyalo Thondup to Tibet and Beijing early August, the TYC expressed its disgust within a fortnight. Agitated over the ongoing dialogue process on the 'middle path' an agitated CENTREX of the TYC announced the reversal of its basic policy of keeping off the election process that elects the members of 'Chitue' the Tibetan exile 'Parliament' as well as the 'Kalon Tripa' (Prime Minister) of the CTA. "So far we believed that they (CTA leadership) are our leaders. And we supported them. Now TYC itself will lead the Tibetan community in its struggle for national freedom," says an agitated Kalsang. Under a democratic constitution initiated by the Dalai Lama himself in 1960 the refugees have elected their Parliament 13 times so far. The peak of this democratic process came last year when refugees elected Prof. Samdhong Rimpoche as the current 'Kalon Tripa' (Prime Minister) through a direct and secret ballot. It is interesting to note that Mr. Gyalo Thondup was eliminated in the very first round of polling for the PM's post as he secured backing of less than 2 percent voters. Interestingly, the constitution empowers the elected Parliament to remove the Dalai Lama as the Head of State if it believes that he is not leading the nation correctly or is incompetent to govern. Most Tibet Support Groups (TSG), a network of over 250 pro-Tibetan freedom action groups of non-Tibetan supporters all over the world, have observed a cautious silence over the sudden resumption of the Dharamsala-Beijing link and the Tibetan delegation's visit. But expressing the common fears of Tibet supporters the California based International Tibet Independence Movement (ITIM), founded by Prof. Jigme Thupten Norbu, the eldest brother of Dalai Lama, has come out openly with a statement denouncing any attempt to dilute the Tibetan demand of total freedom from Chinese occupation. Larry Gerstein, President of ITIM asked all those involved to be 'mindful' of the strong wishes of the overwhelming majority of Tibetans inside Tibet and those in-exile in favour of 'Rangzen'. The statement announced, "ITIM remains unwavering in its commitment to independence for Tibet as the only lasting solution to the China-Tibet dispute.. Anything less than Rangzen, endangers the future of the Tibetan culture and the protection of the Land of the Snowlion." Aware of this strife among the refugee community and the dilemma of Tibet supporters, Prof. Samdong Rimpoche, a popular Gandhian and elected 'Kalon Tripa' (Prime Minister) advised the people to wait for the real outcome of the visit. Dismissing various speculations taking rounds among the exile community and a vast international network of Tibet supporters he sounded non committal about the outcome of delegation's visit. "It is too early to make anything out of the freshly established contact between Tibet and China", he said a few days before the delegation returned home. Soon after the delegation's return Prof. Rimpoche advised the Tibetans and Tibet support groups to refrain from anti-China demonstrations till June next year. 'MIDDLE PATH' All that neither made things any clearer for Tibetans like Tashi or those who are bitterly opposed to the concept of a dialogue over 'middle path'. The reactions of European Union and State Department at the Capitol Hill welcoming the Tibetan delegation's China-Tibet visit have only added to the anger of pro-independence lobby. The worst desperation came in the context of statement issued by Denmark, current EU President which underlined the Union's hope that "this visit will pave the way for direct dialogue between Beijing and the Dalai Lama, leading to a peaceful and lasting solution to the Tibetan question." European Parliament's ultimatum to Beijing expires in a few months in next July. An EP resolution in 2000 made it clear to Beijing that if it failed to hold a meaningful dialogue with Dalai Lama within three years then EP would be compelled to ask its member nations to recognize the Dharamsala based Dalai Lama's Tibetan government in-exile as the 'only and legitimate government representing Tibet'. Most supporters of Tibetan freedom hold Gyalo Thondup responsible for, what they allege 'helping Beijing to wriggle out of EP ultimatum'. "This visit and dialogue have only helped China by sabotaging the first ever chances of winning international recognition to Dalai Lama's exile government", says an angry senior officer of the CTA who is unhappy over the dialogue but would not dare to make his name public. Similar anger is being expressed in the context of reactions of US State Department spokesman Richard Boucher and Paula Dobriansky, the department's special coordinator for Tibetan issues who expressed their pleasure on the visit. US Congress was another Parliament that had issued similar ultimatum to Beijing as done by the EP. They are equally unhappy over the 'insulting' remarks of the Chinese Foreign Ministry who termed the visit as the one undertaken by the delegated in their 'private capacity' who were also permitted to 'meet their relatives in Tibet'. There is no shortage of individual Tibetans who allege that the current exercise is aimed at making President Jiang Zemin's forthcoming visit to US for a summit with President George Bush at his private ranch in Texas. Tibetans and their supporters fear that the new initiative from the CTA will not only create a favourable atmosphere for Zemin in his last official visit before he relinquishes his post but it will also give an 'undue' respectability to the retiring duo of Zemin and Li Peng who are considered to be responsible for what these critics call 'murder of Tibetan culture and national identity' during their rule. TOO EARLY In contrast, optimists among Tibetan refugees and their supporters would love to believe that it is still too early to reach a final opinion on the outcome of the delegation's visit. After all, the community had witnessed similar enthusiasm and anger in early 1980's when six similar delegations visited Tibet and direct as well as indirect channels of dialogue remained active for nearly 15 years before Beijing shut doors on Dalai Lama in 1993. While the proponents of Rangzen are busy gathering all the steam at their command, common refugees like Tashi are loosing their faith in themselves as well the collective esteem. A very new situation within the refugee community which an aging Dalai Lama will have to handle in coming months.